The last day on this station began with another 0500 early CTD, so that those scientists working on how fast the plankton are growing can start another set of experiments. During the afternoon we released another glider. This one has a special chemical sensor on it that has been designed at the National Oceanography Centre. It measures the amoung of nitrate in the water, a key nutrient required by the plankton. 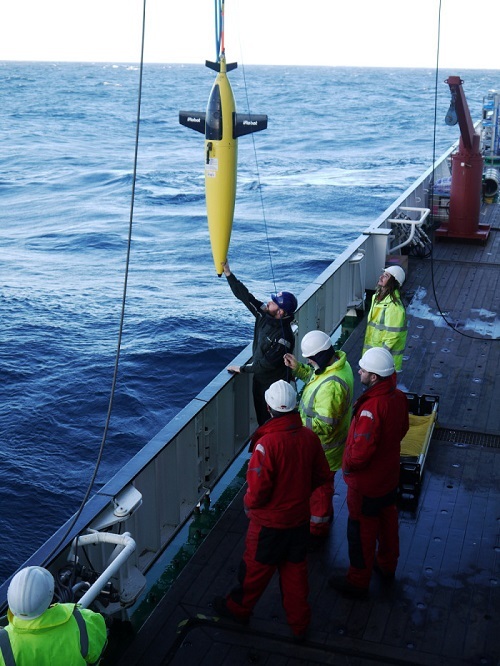 As with the glider yesterday, we are leaving this one in the water just while we are at sea; we aim to retrieve it just before we head back to Southampton in early December. We also had a go at using our “Marine Snow Catcher”. This large tube is designed to trap 400 litres of water at one depth. The tube is then brought back on deck, and all of the tiny particles in the water (plankton, bits of detritus)are allowed to settle in the tube. 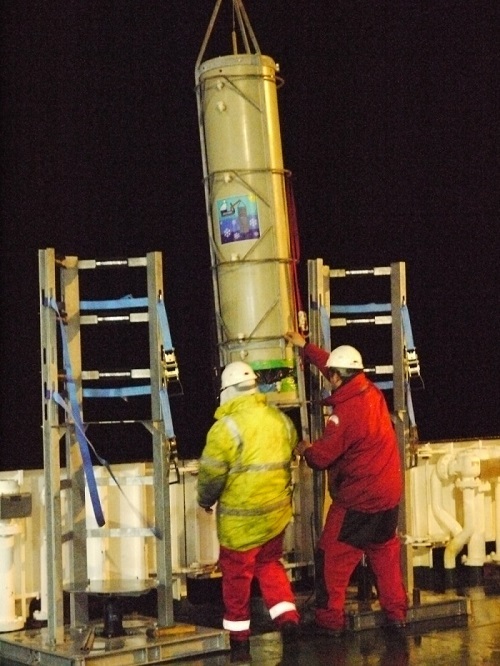 After 2.5 hours the scientists collect particles from near the top of the tube (which will be very tiny and will not have settled far), the middle of the tube and the bottom (containing the coarsest particles which settled quickly). We want to see how the organic matter in these different particles is being recycled by bacteria in the ocean; particularly we want to know if the bacteria recycle nutrients, such as nitrogen and phosphorus, more quickly than they recycle carbon. Our communications are still suffering. It looks like we may be down to a limited email connection for the rest of the trip, with the problem with the main system having been narrowed down to a component that we don’t have a spare of.